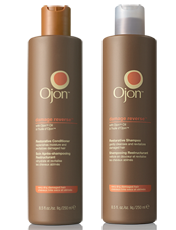 Ojon are offering customers the chance to take home a full size Damage Reverse Shampoo and full size Damage Reverse Conditioner by simply trading in any empty shampoo or conditioner bottle, no purchase necessary! You can read my review of the Damage Reverse Shampoo & Conditioner and also the Damage Reserve Treatment. Customers are invited to visit their nearest John Lewis, selected Boots stores, & House of Fraser on November 8th 2012 to take part in this one day only event. Customers will receive the Damage Reverse Shampoo and Conditioner, worth £41.50 in exchange for an empty shampoo or conditioner bottle from any brand. This offer is on a first come, first served basis and the offer will only stand until stocks last. My tip would be to get there early as this is such a great offer! In line with Ojon’s commitment to ‘protecting the welfare of the land and peoples of the region’, all returned packaging will be sent to our recycling partner, Wastecare, where the packaging will be recycled or used for energy recovery. It states selected boots which to my reading means only certain ones, so if they actually do sell this product does this mean they have to allow this to take place? Also what happens if they have not heard of this offer? How do ewe then get this as we may miss out due to the fact they may not be aware? please contact me at craigduffin32@hotmail.co.uk to let me know if possible, thanks. I had exactly the same problem....I used all my credit in my mobile...trying to find stockists near me....and as I am disabled cannot travel far! So ended up paying more than the worth of both shampoo and conditioner put together! But although I havnt tried it yet I have heard rave reviews. I've yet to try it will defo have to head over to my nearest boots how do i find out if they are participating? my nearest boots how do i find out if they are participating? I've used their stuff; very expensive but worth every penny; tamed my crazy hair for the first time in years! I have never tried this yet but it sounds like what my hair really nedds. Can`t wait to try this, sounds amazing. Please can you let us all know which Boots are participating in this offer. Great, thanks for the offer. Went to John Lewis, they didn't know anything about it, so I was disappointed. GO ON THE QVC WEBSITE,GOOD PRICE TO. been using ojon for about 5 years and love it. this isn't my favourite range, but it's free, so i'm there! Feel free to send me a free Ojon shampoo! I have never tried and would love to try it out! I have very dry hair and damaged and would love to try this. I've never tried it but I would love to use it as I've heard it is pure quality. I have never heard of this range before, but would love to try something different on my hair. My hair is very thin and dry. Would love to see if this does the trick. My hair is very dry and dameged, really need this kind of products. I would love to give Ojon a try! My hair is very oily, really need this kind of products. Have never heard of this product, but would love to try it on my wyward hair. Fine, flyaway hair would love to sample this. great stuff can't wait for my freebie ! Would anyone else LOVE TO TRY THIS or is it just me? I would really love to try this but, sadly, do not have a local John Lewis, after spending over 30 minutes on the phone have found out that i do not have a selected Boots store, and after ringing my local House of Fraser found out they do not stock it either!!! So good luck to anyone who can actually benefit from this "so-called" offer!!! tried this, it's great for blonde hair! is this a real deal or a con I am willing to travel to get this product but do not want to get to a store to find out someone is having me on. Where has this offer info come from??? Are we sure it is genuine - tomorrow is the day! Sounds like another load of old codswallop. Women will swallow any old line if it means spending countless pounds on products that are neithr shown to be effective or worth what they want for them! Guess this is a sexist bloke. I use this and it's fantastic even got my mates using it I wouldn't spend that sort of money if it didn't make any different, give it a try uour be surprised. Got mine at John Lewis Edinburgh this morning! There were quite a few people waiting for the store to open but the staff were well prepared. Well done to them!! Extremly dissapointed with Boots at Liverpool Street Station, which is a huge store and stock some of the range. They know nothing about the offer, and therefore not able to oblige! What a waste of my time....OJON Marketing department, take note!!! John Lewis in Southampton had run out in less than 20 mins ... but staff were well organised! Was at house of Fraser Belfast Victoria square and got mine just after opening at half 9. The women there who I saw get served ahead of me were all offered a free appointment for a facial too. I was the only bloke there and they didn't offer me a facial, although I would have booked one for our lass but thought I'd got the products and would just be being greedy to ask to book a facial for her too. They have run out in Belfast but may still be doing the free facials. Good luck to all those heading out, it's a fantastic giveaway. Buy any item and get a shampoo & conditon free PLUS free postage by entering code "TRADEUP" at the till. Don't get too excited! Went into Birmingham City Centre House of Fraser and Boots - neither had ever heard of Ojon - let alone stock it! Waste of time! I tried all the Boots, John Lewis & House of Fraser stores that are within me getting to but have been told that it may only be the stores on Oxford Street that may do this offer? Is this the case? Thanks.